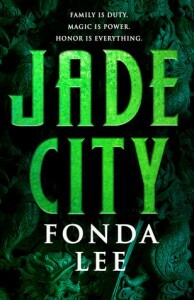 So Fonda Lee has a great idea -- others have employed it as well, don't get me wrong, but the way she does it is great -- instead of setting an Urban Fantasy in this world, just a version of it with some magic; you set it in a world a whole lot like this one -- but you infuse the world with some sort of magic. A world where technology/science and magic co-exist. It's enough like this world that you can get your hands around cultural mores and norms. There's this stone, a mineral, called jade. It looks a lot like our jade (from what I can tell, Hank Schrader, I'm not). Certain people are sensitive to it, and it enables them to channel magic, some become addicted to the mineral and what it does to them -- others ("stone eyes") are completely insensitive to it and are therefore the ideal candidates to shape it, transport it, and mine it. Only people from Kekon have this relationship with jade (not that unexpectedly, they're also the world's source for it). There are other countries that want jade and what it can do to a person -- military uses, primarily. But their people aren't natively sensitive, so they're working on ways to engineer the sensitivity. There's a lot of money to be made controlling the Jade. Years ago -- a generation or so -- a group of "Green Bone" warriors drove foreign powers from Kekon and assumed control of the Jade trade. Working with the legitimate government, these Green Bones rule Kekon. They are, for all intents and purposes, a criminal organization -- or would've been were it not for a divergence of vision -- they're now two rival criminal organizations -- with their own rules, laws, rituals, educational systems and cultures. There's a Cold War between them -- a perilous truce, with the citizens of Kekon stuck in the middle (paying tribute, currying favor, and occasionally serving as cannon fodder). But then something shifts the balance of power -- plans that have been brewing for years start to come to fruition and conflict erupts. We focus on the Kaul family, their soldiers, their leadership, their friends and fortunes. There's the aged warrior struggling with the weight of glory and past success in the face of the end of their life, there's the new generation of leadership, trying to live up to the glories of the past and finding it more difficult than they expected. Some have tried to forge new paths in a new world, others are trying to recreate the past. This is one of those that I can't think how to describe without ruining everything -- so that's about as much as I'm going to say. The back cover blurb describes this as "The Godfather with Magic." It's easy to see why. It's also incredibly easy to start casting various characters ___ is Michael (clearly), ___ is Tom, and if ____ isn't Sonny, I'll eat my hat. I do have real answers for those blanks, but I thought I'd better not give everything away. It is more than just The Godfather with Magic -- but you can't get away from that (unless you're not that familiar with that particular work -- and then you're not missing a thing). There's magic, there's a mob story, there's family, love, loyalty . . . you name it, this book has it. Better yet, at the helm of this world you have Fonda Lee who does a great job building this world and populating it with people that the reader can relate to. This is a rich world full of intrigue, danger, family and magic. It's a fantastic piece of worldbuilding and you can tell that Lee has great plans in store for these characters, and I can tell that they have no clue what's coming -- and frankly, the readers have less of a clue. I'm looking forward to seeing just what it is. Note that's close to a disclaimer, yeah, I said ARC for a book that was published last year. How'd I manage that? Time travel? Well, no. I won the ARC at Indie Bookstore Day (or something like that). So, there be a couple of changes between what I read and the final product, but probably nothing major.